Sharon Denise Allison-Ottey, M.D., is an energetic, motivating, and insightful speaker that shares her expertise in the area of health and self esteem, particularly focused on women. Dr. Sharon reaches the heart and spirit of women in her unique approach and her ability to break down medical/health information in a way that anyone can readily understand. Dr. Sharon is a fellowship trained Geriatrician & residency trained in Internal Medicine. She currently serves as the CEO of COSHAR Medical Inc.She is one of the founding board members of the COSHAR Foundation, a nonprofit organization focused on impacting the health of the nation one community at a time. Dr. Sharon, who recently completed her first novel, All I Ever Did Was Love a Man, believes life doesn't end until the last breath is taken, and up to that point we all want life to be fulfilling. Sharon Denise Allison-Ottey, M.D., is an energetic and engaging speaker, author, health educator/physician and health strategist/consultant. Dr. Allison-Ottey serves as Executive Director and Director of Health and Community Initiatives of The COSHAR Foundation. The foundation is a 501 c 3 organization focused on impacting the health of the world, one community at a time. Under her leadership, the foundation has expanded its presence and impact with innovative programs that have touched millions of lives. Dr. Allison-Ottey completed a three year residency program in Internal Medicine (Adult Medicine) at Union Memorial Hospital. It was during her residency training that she developed a keen interest in the elderly and subsequently completed an additional two year fellowship in Geriatric Medicine (Adults over 65) at the same institution. She received her medical degree from East Carolina University School of Medicine. Dr. Allison-Ottey is a proud alumna of North Carolina Central University where she earned dual degrees in Biology and Chemistry with minors in Physics, African American History and English with honors. Dr. Allison-Ottey is an avid medical researcher with numerous publications and presentations. She was named the American Geriatric Society’s 1999 Investigator of the Year in recognition of her pioneering work in AIDS in the Elderly and was one of the first in the world to publish on this topic. Throughout her career she’s been involved actively with biomedical research and has served as a Scientific Consultant in Neurobehavioral Toxicology to the United States Environmental Protection Agency. Additionally, she has been engaged in several research collaborations that include the John Hopkins Urban Health Institute, the Gallup Organization and other academic, private, and public organizations. Her current research interests include Health Literacy, Patient/Physician Communication, the Role of Spirituality in Medical Outcomes, Direct to Consumer Marketing’s effect on Physicians and Patients, and Patient Adherence/Compliance with Medical Treatment. Dr. Allison-Ottey is a nationally recognized lecturer/speaker for healthcare professionals. She addresses various topics which include but are not limited to: health literacy, women’s health, health disparities and cultural competency, the role of faith based organizations in healthcare, direct to consumer advertisements and health in an aging population. She provides invaluable insight and guidance to the numerous commissions, advisory boards and committees on which she serves. She is a consultant for several Fortune 500 companies and is also frequently invited to give expert testimony/advice to government and other organizations. Dr. Allison-Ottey is recognized for her unique and articulate views on public health policy. She is an advocate for improved healthcare for all and for the elimination of health disparities based on gender, race and/or socioeconomic status. Further, she’s viewed by many as a tireless champion for expanded access to healthcare for the elderly. In recognition for her commitment to health education and reduction in health disparities among minority populations and women; she was honored by Aetna Inc. and featured in the 25th Anniversary Edition of its African American History Calendar. Dr. Sharon Allison-Ottey is active with numerous medical, political and civic organizations. She has served on the Board of Trustees of the National Medical Association (NMA) and as Chair of the Council on the Concerns of Women Physicians. 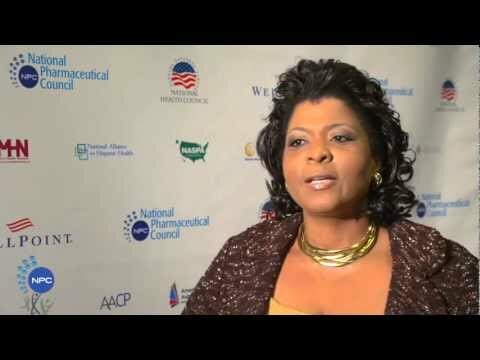 She was a founding board member of the Partnership for Clear Health Communications which focused on improving health literacy in the United States. Dr. Allison-Ottey’s professional affiliations include the American Medical Association, American College of Physicians, American Geriatric Society, International AIDS Society and numerous other organizations. Dr. Allison-Ottey has received many awards and citations from organizations and the community; however one of the most notable is being the youngest to ever receive the Scroll of Merit of the NMA in 2002. This award is the highest award of the association and Dr. Allison-Ottey was cited for her service to the organization, research and commitment to the health education of the nation. Additionally, she is the first female to be awarded the title Chairman Emeritus of the Student National Medical Association (SNMA). In 2006 she received the Council Award from the Council on the Concerns of Women Physicians in recognition for her significant achievements in medicine and contributions to issues of women’s health. Dr. Allison-Ottey has been further humbled by the National Library of Medicine/ American Medical Woman’s Association’s designation as a Local Legend in Medicine and her inclusion in the national exhibit entitled: Changing the Face of Medicine: Celebrating America's Women Physicians. She continues to receive national and state recognition for her work and passion and in 2008 and 2004; Dr. Allison-Ottey was named to the Top 100 Women in Maryland. Dr. Allison-Ottey has appeared on Black Entertainment Television (BET) as well as other local and national television programs. She co-hosted a popular radio program for several years and is a frequent guest on nationally syndicated as well as regional/local radio programs across the country. Dr. Allison-Ottey is the monthly writer of Gospel Today magazine’s, Health in Action column. She’s been quoted and interviewed by several print publications including Redbook, Essence, Heart and Soul, Jet, Ebony, USA Today, Black Enterprise, The Wall Street Journal and numerous other media outlets. Because of the colorful and “down to earth” manner in which she addresses health, relationships and offers motivation; Dr. Allison-Ottey is a well-recognized and requested speaker for conferences, universities/schools, churches, corporations, community groups and a host of other outlets. Obesity and Heart Disease in Women Sisters the Clock is Ticking! Is That Fried Chicken Wing Worth It? A Get Real Approach to Dealing with WEIGHT, Not a Diet but a Mindset!